The air quality index (AQI) in Lahore reached 515 on December 25 surpassing the other most polluted cities in the world. This is not the first time Lahore has been in headlines regarding air pollution. The city remained under dense smog for the better part of October and November this year. The phenomena of smog became popular in the last ten years or so in Pakistan. However, it is getting worse every year. 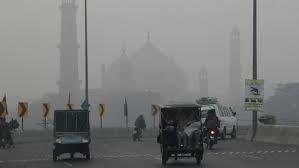 The New York Times went on to declare smog as the fifth season in Lahore City. The experts are of the view that the entire population of Lahore is at risk of getting diseases due to deteriorating air quality. The dangerous particulate matter known as PM 2.5 is one of the major contents of the air in Lahore. PM 2.5 is particulate matter 2.5 micrometers or less in diameter and is commonly known as fine particles. These particles are so small that they can penetrate the epithelial lining of the internal organs and can reach blood stream. PM 2.5 has reached 1,077 micrograms per cubic meter in Lahore – more than 30 times what is considered to be the safe limit. The other type is PM10 which 10 micrometers or less in diameter. It raises the risk of stroke, heart disease, lung cancer and chronic and acute respiratory diseases, including asthma. Primary PM and the precursor gases can have both man-made and natural sources. Man-made sources include combustion engines (both diesel and petrol), solid-fuel (coal, lignite, heavy oil and biomass) combustion for energy production in households and industry, other industrial activities (building, mining, manufacture of cement, ceramic and bricks, and smelting), and erosion of the pavement by road traffic and abrasion of brakes and tyres. Almost all of these sources are responsible for the deteriorating air quality in Lahore. In addition, the continuitng demolition of the buildings, never ending construction activities and disappearence of trees are also contributing to the air pollution. It is mainly the responsibilty of the government to tackle this issue. However, if the political will is missing on the governmen side, then the residents of the city need to play an active role by changing their life style as well as acting as a pressure group in order to persuade government to take action. Poeple need to devise ways to conserve energy. Instead of using own cars, they must use public transportation, bike or walk. At least the citizens of Lahore have no excuse in this regard keeping in view the high quality of public transport facilities. Instead of burning leaves and woods, they need to mulch or compost which will reduce the hazardous gases emission. Using plastic bags should be avoided as much as possible. Food should not be wasted. Citizens should try to grow their own food. They also need to recycle as much of the products as they can so that they can be reused later on in other products. Reduction of outdoor air pollutants requires concerted action by public authorities, industry and individuals at regional level. Responsible authorities with a vested interest in air pollution management include the environment, transport, land planning, public health, housing and energy sectors. All of these stakeholders need to play their due role to make this city a healthy place to live.